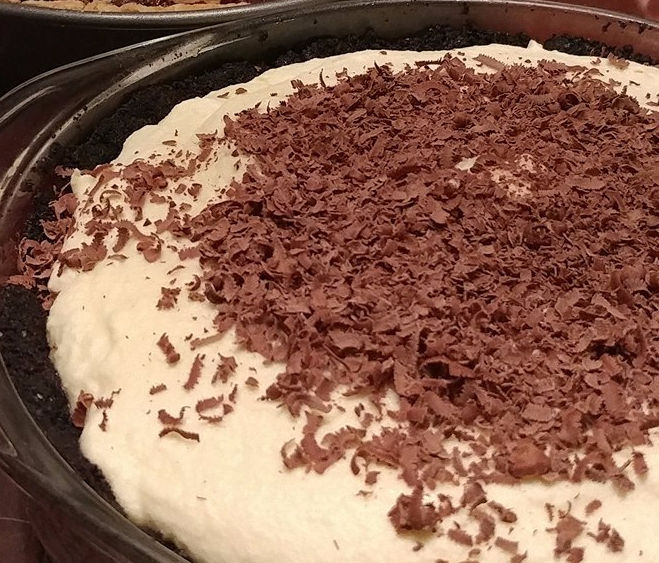 Grasshopper pie is kind of an old school southern dessert, the kind made in the 1960s out of prepackages items… I’m to fancy for that. But not fancy enough to try to find the right liquor – so instead of finding creme de menthe – we went with peppermint schnapps. Slight problem (possibly a problem? maybe not?) with that is that creme de menthe (and creme de cacao which most recipes also call for) are like 25% alcohol, but schnapps is like 50%. The pie kept really well though! This pie starts with a chocolate cookie crust, which you can buy, or use oreo cookies for, or other chocolate cookies… or you can make your own. Which I did (then stuffed them in a suitcase and tried not to eat them out of desperation). Smitten Kitchen Oreo Recipe is my favorite recipe. Don’t make the filling. And you don’t have to make the cookies pretty if you’re crumbling them into a pie crust. Melt the butter & mix it with the cookies and sugar. Press into a greased/buttered pie tin – or pyrex. Put in the oven, and back for 10 minutes. In a metal bowl, dissolve the gelatin in about 1/4 C cream. Let sit for 5 minutes. Crush the mint, and heat it with 1/4 C of cream. Set aside to steep. Start a saucepan of water to boil, one that the bowl will fit snuggly on. Get another bowl ready with an ice bath (ice and water) to chill the mixture. Whisk in the sugar, and mint, and schnapps. Strain the mint from the cream, and add to the custard. The mixture will become a custard consistency at around 150 ° F – and you might take it off the heat before 160 if you trust your eggs. Put the hot bowl into the ice bath to chill. Take the remaining cream (1 Cup) and whip it to stiff peaks. Fold the whipped cream into the custard mixture. Put the fluffy custard mixture into the pie crust, and chill for a couple hours, till it’s set. Grate chocolate over the top just before serving. (Don’t touch the chocolate shavings, they will melt).